I've been wanting to try an image transfer on tumbled marble --- so I gave it a whirl today - and...voila...it works beautifully! I made these tumbled marble coasters for Jill and Cooper. I will also be making these to sell - they make fun gifts when they are personalized -- just picture favorite old family photo's on them (always a photocopy, never the original!) 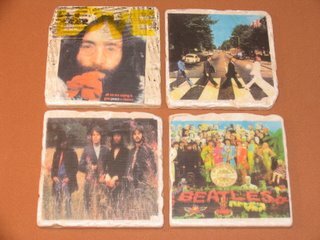 -- or your pet -- or your favorite Beatle :-) They measure roughly 4"x4" and are as solid as..well...tumbled marble :-) I use a foam backing on them..so no slip sliding away! Email me at studiolasarre@bellakarma to tell me what you'd like on your coasters! I love these coasters! I was so hesistant to put my drink on 'em though, because they are such cool pieces of art. Finally I put my glass on one - and it's perfectly fine. I want more! Please.